Finding it hard to balance work-family-workouts? Fatherhood is always a big jump for any man. A bachelor’s lifestyle is so much different from a family guy’s day-to-day tasks. For one, parents’ time is split between work and family, and very few ever find time to do anything else. In this year’s Father’s Day special, we’ll talk about blending fatherhood and fitness, and finally answer how often dads should exercise. In a nutshell, full-time working dads rarely have enough time for exercise. If they have time to spare, they’d rather spend it on their kids, work on their car, or simply get a low-key relaxation in front of the TV. It’s quite rare to find a dad with a nice, toned structure who has a white collar job. For many men, a dad’s fitness regimen only involves diet and a quick jog whenever they get the chance. If you’re a dad, you’d be pleased to know that you could work out without having to take some time off work, or give up some quality time with your family. Finding time for working out is as simple as time management, and making use of your daily routine as a way for you to maximize exercise. Dads with 9-5 work schedules have the most time to work out but taking the time to exercise means taking time off from your family. In these cases, you can do workouts with your family, and maybe even turn it into a regular family thing where you run or use the bike together. The objective is to burn calories and at the same time increase the amount of blood flowing through your body to prevent stagnation, and also to promote better muscle strength. You can also purchase some cheap dumbbells and weights which you can store in your basement and use at home. You can watch your kid play video games before dinner and be done with your workout even before your wife calls you to the table. 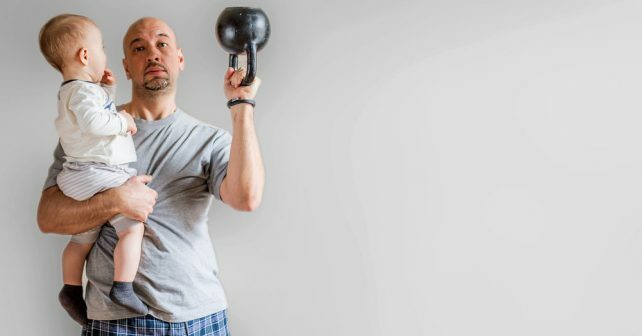 Workouts at home is the best alternative for dads since finding the right gym and actually attending the gym takes precious time off from your family. Going to the gym takes so much time, and it takes you away from your fatherly duties, but that doesn’t mean that you shouldn’t hit the gym once in a while. Many dads I’ve talked to follow a specific schedule – one that they follow religiously. The common pattern I’ve seen is to work out after their last work day of the week, and wake up early to work out before their first work day of the week. Some of them talk about their workout schedules with their wives to figure out who’s assigned to watch the kids while the other is working out. This kind of schedule makes it much easier to follow because you’d appreciate the time you have working out, and that you’d have to make the most of it. Since you can only train for a limited amount of time, it’s best to make the most of it by doing intense strength training exercises during your weekly gym time. You can do little bits of cardio by jogging or riding your bike to work. Some simple things like parking your car away from the entrance of your building can already make you burn some excess calories for the day. Take the stairs instead of the elevator. These tasks can help you achieve your fitness goals consistently, and you’d be able to effectively balance strength training, family time, and work. All the time constraints from your various responsibilities can take a toll on your workout progress. The secret is to get the most out of your workouts. You can make the most of your workouts by taking the best supplements for muscle building. These supplements help you achieve muscle gains faster than by simply working out. You can use NitroGenix 365 to help you optimize the gains you get from working out, and even gain muscle during your off-time.